My nonna makes some great Italian desserts, recipes from the Veneto/Friuli-Venezia-Giulia regions such as Italian apple strudel (with cheeky ribbons of chocolate, whole pine nuts and plump grappa-soaked sultanas), crostoli and fritole. But she doesn't make my favourite Italian dessert, panna cotta. Luckily, my mother does. The best thing about panna cotta is that while it looks impressive, it's insanely simple to make and can be done a day in advance of a dinner party. Plus, different accompaniments make it a different dish each time. 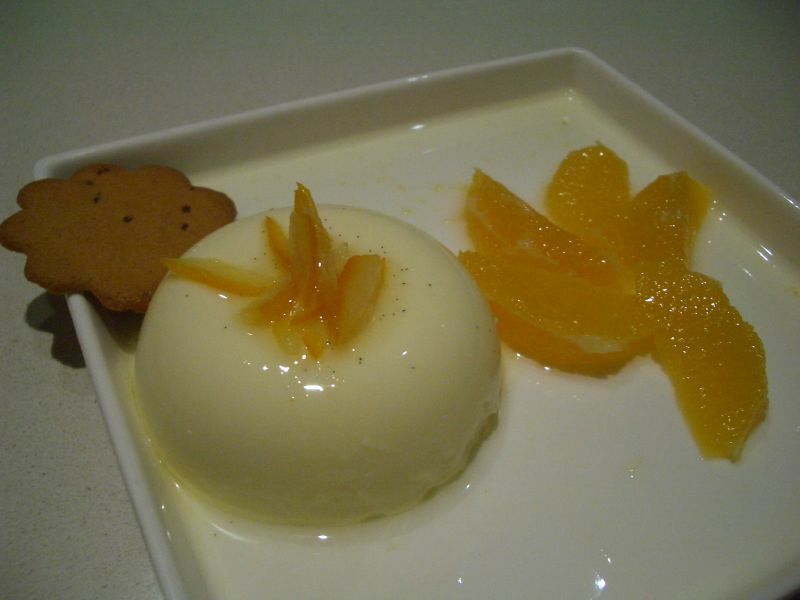 Even I - it shames me to say that despite my love for delicious food I'm still pretty hopeless in the kitchen - can make an impressive panna cotta. Mum and I find the Donna Hay recipe to work best, and of course you have to use proper flecks of vanilla from a vanilla bean - no essence! 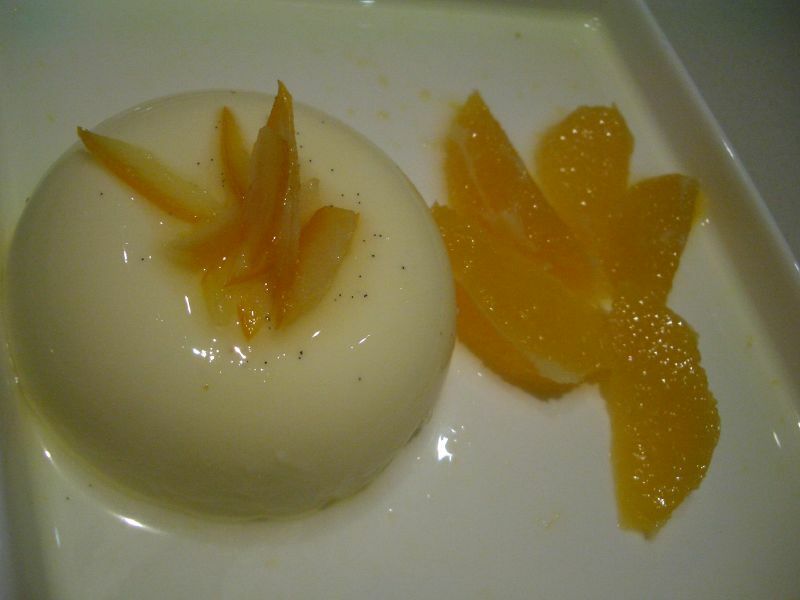 This is the panna cotta my mum made a few weeks ago. To serve, she first made a thick syrup boiled together with julienned bits of candied orange rind. Then, having removed all trace of pith from the peeled oranges cut into thin segments, she made a second, lighter syrup for the orange segments using a bit of the thick syrup, orange juice, Cointreau, a dash of water and a dash of rosewater. Optional gingersnap on the side! 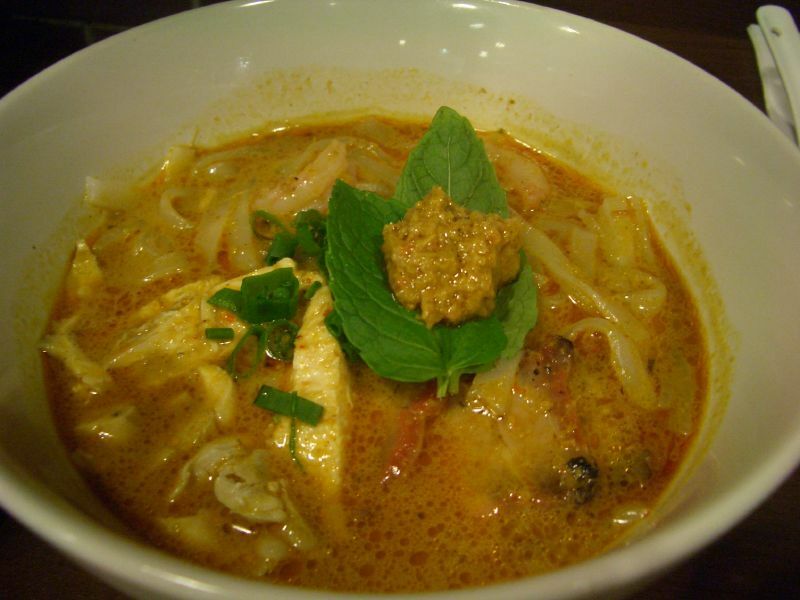 Since its opening in May, Allan (Ah Mu) Woo’s new venture Laksa Me has been extensively reviewed by Melbourne food bloggers (here, here and here... and here again!). On an evening out with a group of friends, we decided we’d finally go see what all the fuss was about, having already had a few drinks at Golden Monkey and having attended the opening night party for Detroit artist Glen Barr’s exhibition at Outre Gallery (Mr Barr, despite a touch of jetlag, turned out to be lovely and charming, in contrast to his often (deliciously) dark and twisted images). Unfortunately we’d forgotten to book and when we arrived at the top of the hill, all tables at Laksa Me were occupied for the foreseeable future. The Laksa Me boys were very accommodating though, promising to call us on L’s mobile once a table became free. We waited for about ten minutes across the laneway in the excellent newish bar New Gold Mountain, next door to Double Happiness (note to self – must spend a languid evening reclining on cushions and drinking delicious concoctions at NGM very soon). Once we were seated back at Laksa Me, we decided to try a whole lot of their entrees (“they’re Asian tapas”, the waiter informed me brightly) before getting laksa. 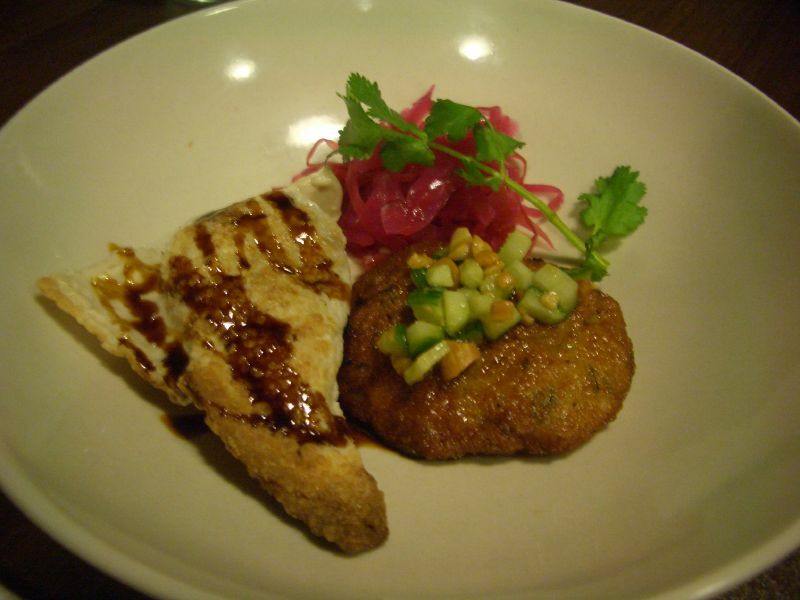 Pictured above is one of the Vegetarian Triangles and a Thai Fish Cake. We all had a triangle (they were superb - according to the menu they contained wok tossed shredded daikon, crunchy yam bean and Asian chives, folded in Chinese white pastry, pan fried and served with caramelised dark sweet soy sauce - tasty but not at all heavy). M reported back to us that the fish cake was also delicious. 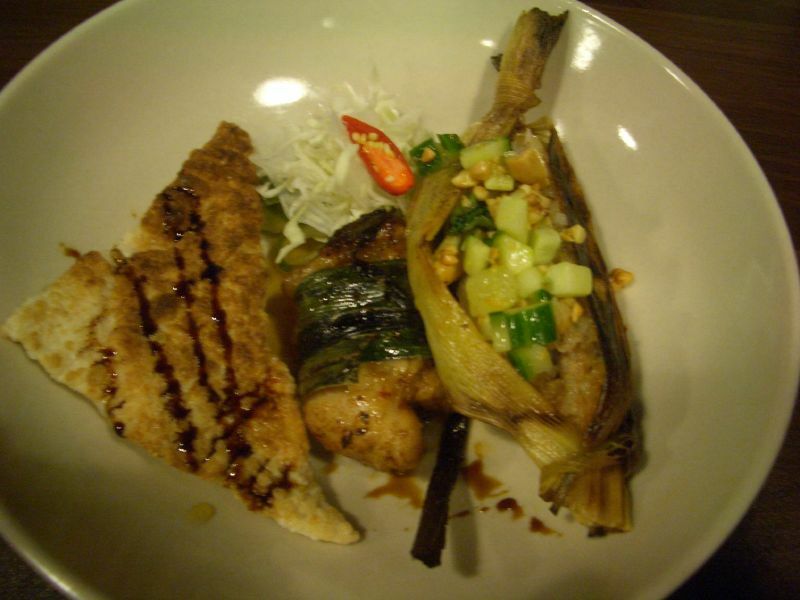 Pictured above are, from left to right, a Vegetarian Triangle, Pandan Chicken and a Succulent Thai Grilled Sausage. The chicken was wrapped with a pandan leaf (bai toey in Thailand) and deep fried, allowing the delicate flavour of the leaf to permeate the leaf. Yummy. And as for the sausage, the ever-informative menu told us it was of "Northern Thai origin with a hint of Spanish twists. Savoury jasmine rice and minced pork wrapped in cornhusk, grilled to perfection and served with diced cucumber and crushed peanuts in a tangy Chinese salted plum sauce." I think the sausage was my favourite of the tapas, but they were all brilliant. When it came time for the mains, the other four girls were unable to resist the lure of My Mum’s Laksa, which uses fresh pho noodles instead of the usual vermicelli. 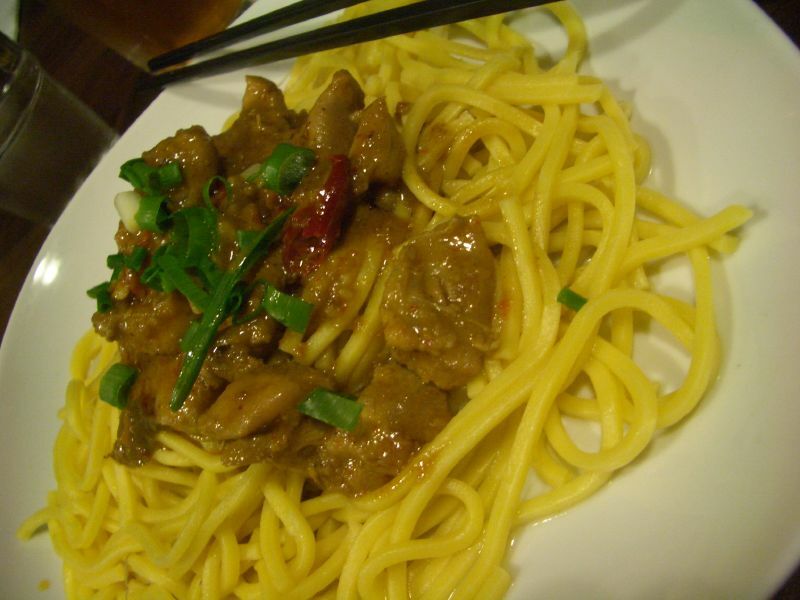 It turned out to be a wise choice – rich and creamy, with big juicy prawns and fresh chicken. Although I’d been intending to have laksa too, I’d decided in the interests of diversity to try something different. Sucker for names that I am, I saw that one of the noodle dishes was called Popular Dry Chicken Curry Noodles and chose them, interested to see what made them so “popular”. Our friendly waiter’s caution that they were spicy only encouraged me further. I liked this dish but it wasn’t as good as the “tapas” had been. As for the presentation of the dish with the sauce in a neat pile on the centre of plain noodles... well, I suppose it was more visually interesting than having it all mixed together, but it certainly did make the noodles drier rather than sloppier. However this is a minor point: it was an enjoyable and very reasonably priced meal (the laksa and the noodles were only $10 each! ), and I look forward to returning there again soon. Oh, and like other bloggers, we found the restaurant too cold: turn the heating up fellas and next time K will take off her winter coat while eating! I’d hear whispers about a crêperie around the corner from work, near the Station Formerly Known as Spencer Street Station. I read Liz Cincotta’s Epicure review and thought “hey, it sounds pretty good”, so went down there the other day to meet my friend F for lunch. Choix is in the same laneway as Blufish and does a variety of savoury and sweet crêpes. I’m sorry to say it, but this place got the thumbs down. 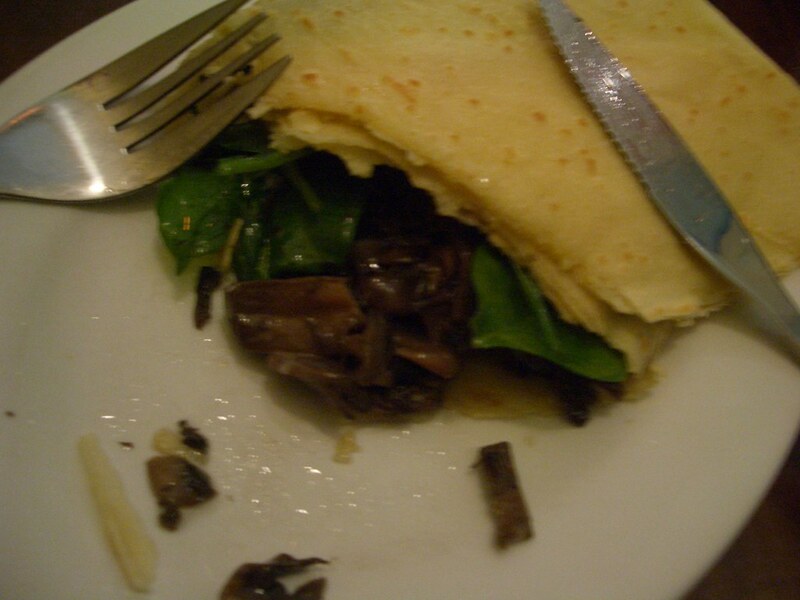 The crêpe was pretty average: the filling of mushroom, baby spinach and taleggio was fine, but the crêpe itself was dry, leathery and flavourless. As you can see from the photo, all the filling was tucked into one fold of the crêpe – all the other folds were dry and empty and frankly inedible. As for the venue itself, I’m not sure whether or not it has changed hands since the Epicure review, but F and I found it an unpleasant dining venue because of the lingering smell of old grease and bleach. I think they need to invest in better ventilation! I don’t like writing negative reviews, but that was our experience and I’m afraid I won’t be heading back there any time soon... if anyone has had a different experience there I'd like to hear about it! Hmm, I think Beetroot falls just outside the "very quick easy distance" radius from the office to qualify as part of my "King / Bourke" quest. Nevertheless, I'm here to report on some of the goodies they're serving up at the moment from their treasure trove of a display cabinet. I went to Beetroot a few weeks ago to meet my Dad for lunch. Beetroot is north of Lonsdale St, where Hardware Lane becomes Hardware Street. Having foolishly stopped for a quick browse of the new release albums in the excellent Discurio a few doors down, I arrived a few minutes late and found Dad waiting for a table in the packed cafe. I've read and heard very good things about Beetroot's fabulous-looking breakfast menu, and am determined to get down there early sometime soon. For lunch, we made our choices from the aforementioned display cabinet: I chose the eggplant bake, and Dad chose the stuffed capsicum, washed down by glasses of pinot noir - so nice for a cafe-looking place such as this to have a half-decent wine list! 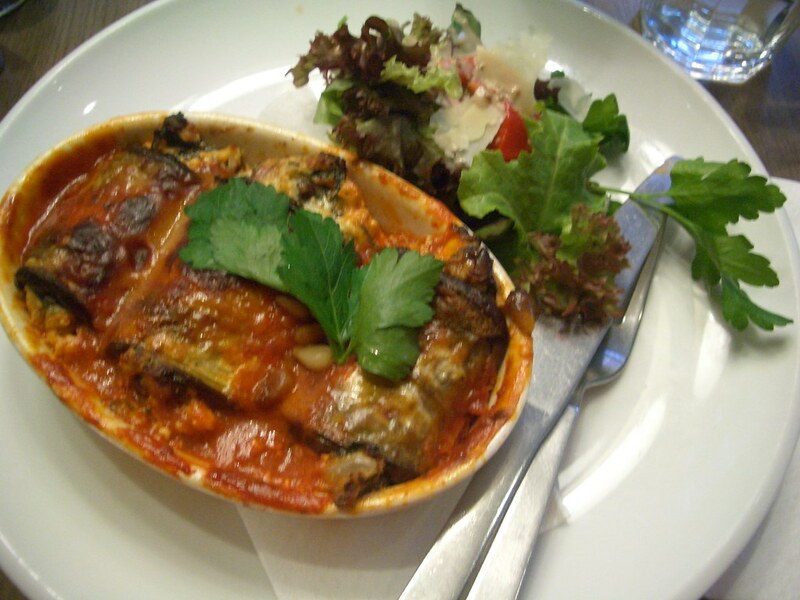 This eggplant bake was brilliant! It was a variant on cannelloni in that there were rolls filled with spinach and ricotta, but instead of pasta the rolls were made of eggplant. The tomato-based sauce was lovely and rich, and the filling was studded with all sorts of juicy little nuggets like currants and pine nuts. 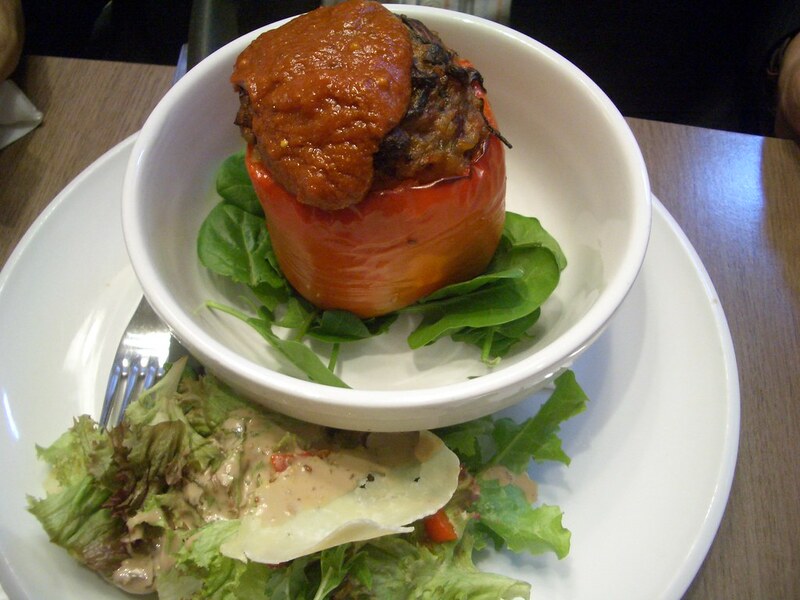 Dad's stuffed capsicum was also "a cut above", to use his words. It was made interesting by tiny bits of chopped chorizo in addition to the usual meatloaf-like filling. Both dishes, as you can see, also came with a nice bit of salad on the side. 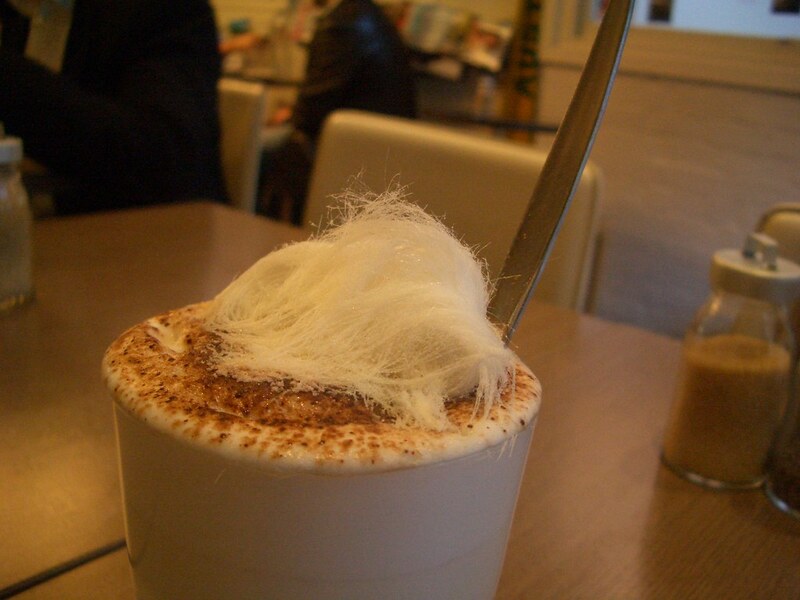 But what really made this gastronome's day was the hot chocolate. At Beetroot it comes in either white, milk or dark chocolate, and they use proper rich chocolate at the bottom of the glass and hot frothed milk over the top so you can mix it all together or, if you're like me, try to scoop up as much of the melting milk chocolate as possible with your tall spoon. 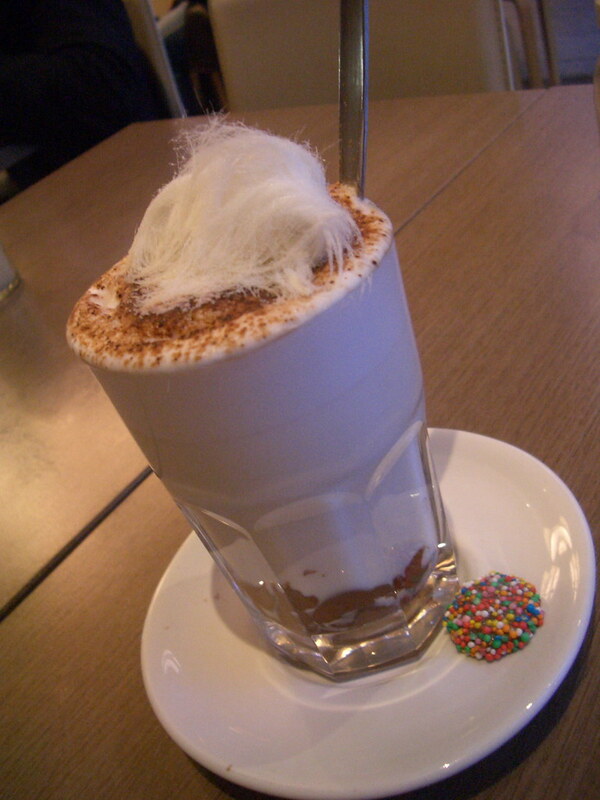 A friendly little chocolate freckle on the side of the plate is a cute touch, but the piece de resistance is the marvellously over-the-top wisp of Persian fairy floss that perches on top. Pretentious? Yes. Did I love it? Most definitely! 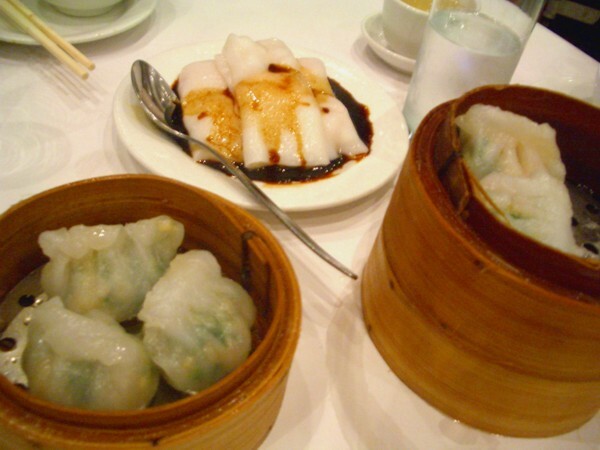 Does the above picture of yum yum yum cha make you drool? If so, read on! It's been a couple of months since the last YCP meeting (the fact that I'm moving house on Saturday means that recent weekends have been extra busy for me), but at long last, it's time for the 'Cha once more... 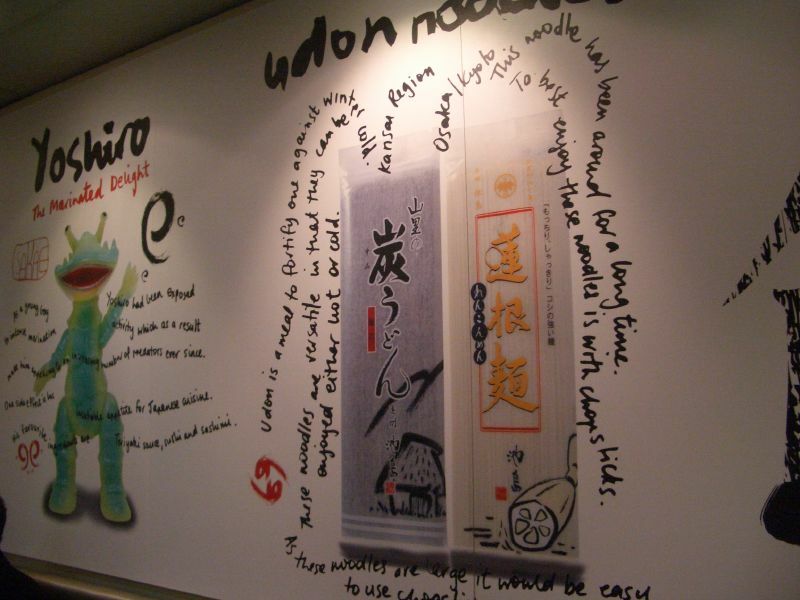 The Yum Cha Posse is a highly informal group of people united by their love for - yes, you guessed it. Numbers fluctuate from meeting to meeting: sometimes it's just four, sometimes it's twenty-four. The next YCP meeting will be held at lunchtime on Sunday 22nd July. Exact hour to be confirmed. The venue? How could I resist dumplings with googly eyes?? 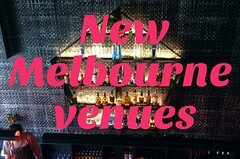 The venue is Ripples Seafood and BBQ Restaurant, 40 Glenferrie Road, Malvern. Let me know if you want to come along, so I know how big a round table to book! 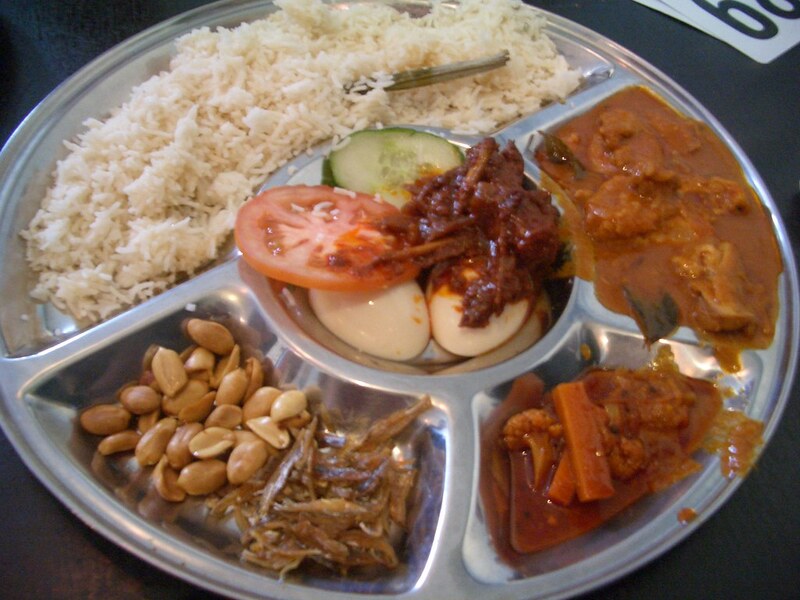 In a recent blog about one of my culinary obsessions (nasi lemak) I mentioned my favourite nasi lemak place in Melbourne, Norsiah's Kitchen. I never seem to get up near Melbourne Uni any more so I haven't blogged about it yet, but mentioned that antirealmadrid had reviewed it on his blog. Norsiah's Kitchen is an unpretentious bain marie place specialising in Malaysian, Singaporean and Indonesian food on Swanston St in Carlton, just south of Grattan St. I discovered it early last year by literally following my nose from the tram stop in the direction of the spicy goodness wafting from its door. It is run by a friendly Malaysian couple who give students a 10% discount, and my uni friends and I loved visiting it for the nasi lemak and sinful $2 fried chicken drumsticks. Fast forward to today: my uni friend L writes me an excited email alerting me to the fact that our humble little Norsiah's (which previously had almost zero presence on the web - I'd tried in vain to google its address) was reviewed today in Matt Preston's column in the Epicure! Given our protective fondness for the place, L and I both felt like proud parents reading the review. Here is MP's review. He doesn't think much of the rendang, but the review is otherwise pretty good. He mentions the "stink bean" petai and their unusual taste - much as I pride myself on tasting (almost) anything at least once, I decided petai really just weren't for me when I tried them once at Norsiah's in a mee goreng. 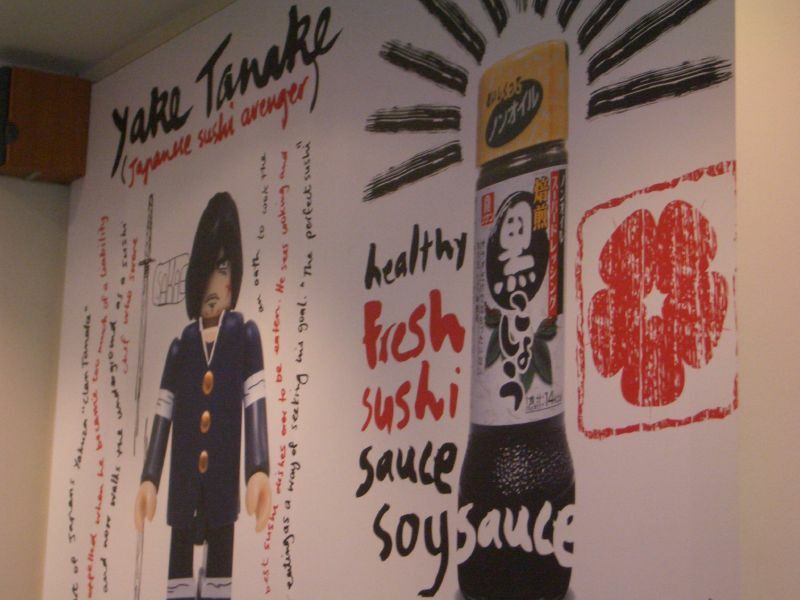 Meet Yake Tanake, Japanese sushi avenger. Once a part of Japan's Yakuza "Clan Tanake" but expelled when he became too much of a liability and now walks the underground as a sushi chef who swore an oath to wok the best sushi dishes ever to be eaten. He sees woking and eating as a way of seeking his goal. "The perfect sushi". My colleague K introduced me to Sakae the other week, and on Thursday I invited my friends M and L to meet me there for lunch. At Sakae there is a good variety of sushi and sashimi, or you can order from the hot menu of donburi, udon, ramen and bento boxes. 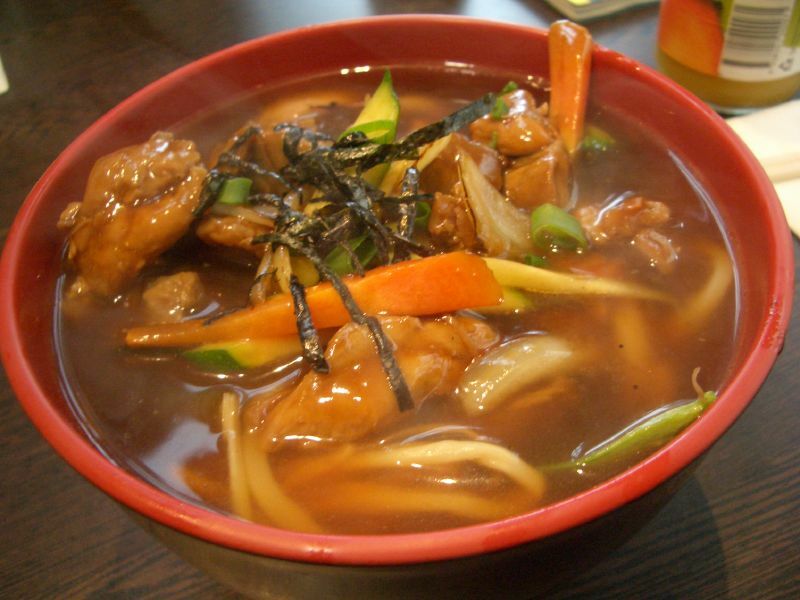 As it was freezing and pouring with rain outside, I chose a bowl of chicken teriyaki udon. They took a little while to arrive, but were worth the wait - fresh chicken, lots of veggies and noodles and flavoursome broth that you can see steaming in the photo! 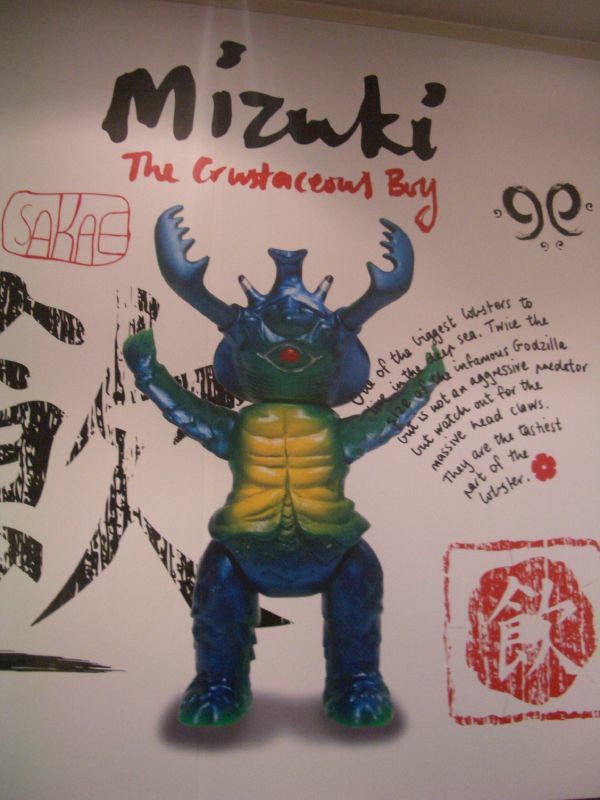 I loved it, and have decided Sakae will be my "go to" Japanese cafe around the corner from work. I was a little nervous on Thursday suggesting we go for Japanese as M is from Japan, but happily she gave Sakae two thumbs up! Little Peninsula is in Little Lonsdale St, just across the road and down a bit from Horse Bazaar. Both their menu and their wine list are crammed with goodies from the Mornington Peninsula. I have it on good authority that their antipasto platter is excellent, but when I visited it the other week, I only had time for a hot chocolate... but what a hot chocolate it was! 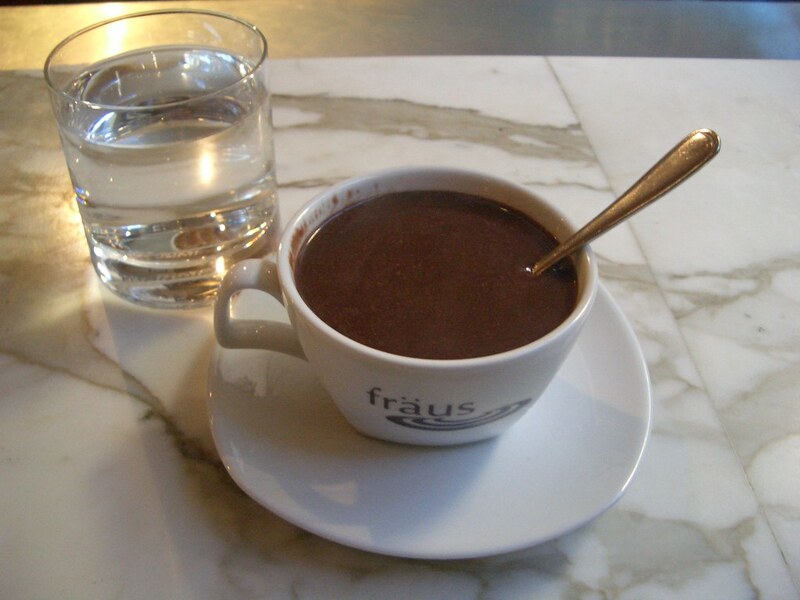 Fräus hot chocolate is popping up in discerning cafés and restaurants all over town. 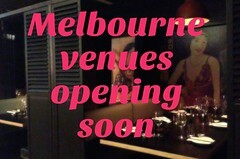 The Fräus team have a great little crêperie over in North Melbourne which I visited last year and liked very much. Their Italian-style hot chocolate is delicious but so insanely rich and thick that you can't really just pick it up and drink it (instead, one eats it with a teaspoon), and a glass of water is needed on standby. Fabulous on a wintry afternoon! The search for tasty food in the vicinity of King and Bourke Streets continues. Happily, last week my colleague L introduced me to a great little place that does Indian/Malaysian/Sri Lankan/Vegetarian/Singaporean (yes, they fit all that on their business card!) food. It's called Riks Maha and is located in Healeys Lane, which runs from Lon to Lt Lon between William and King. Its sister restaurant is called Rich Maha, which is located on Little Collins near the corner of Elizerbeth St, according to its website... :) Both dish up no-frills tasty curries from the bain marie at extremely good prices. On my first visit I decided to try one of my favourite dishes, nasi lemak. This one also comes highly recommended. 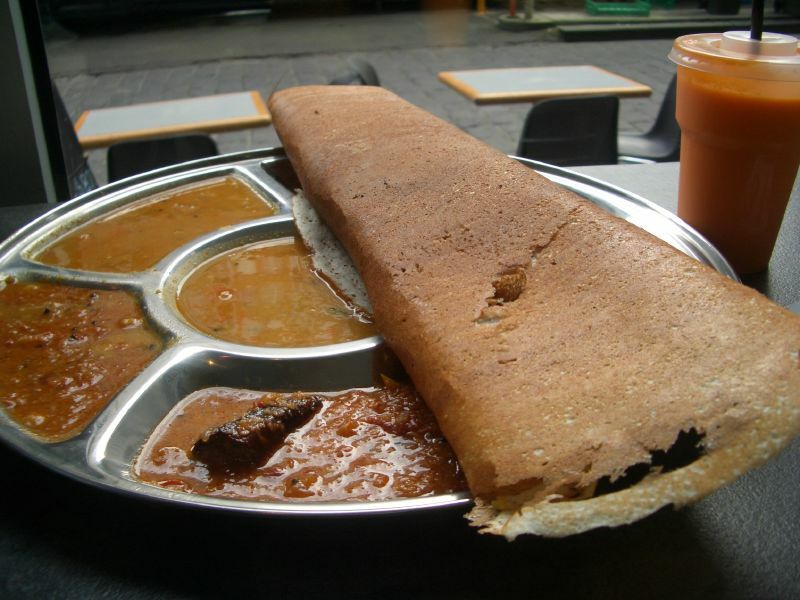 As you can see, the dosai came out nice and perky, with a good balance of softness and crispness. It was filled with a veggie masala, and came with side serves of sambar and chutney. The sambar, with its mustard seeds and fragant spices, was particularly good. 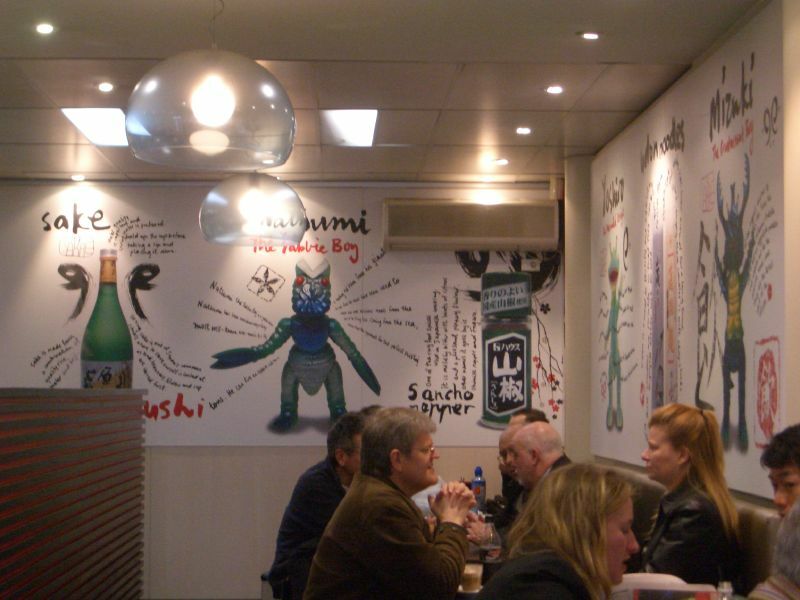 RM will become a regular lunch haunt, methinks..